Cézanne rarely engaged with genre painting – depictions of everyday life where figures are presented as generic types, not as portraits of named individuals. But with his series of Card Players and their associated studies, he spent around six years in the 1890s studying and developing this one subject, using his own farm workers as models. An exhibition at London’s Courtauld Gallery examines many of these works in depth and argues for a revision of the order in which the principal works were painted, thereby shedding new light on Cézanne’s working methods and aims. Before entering the one large room displaying the Cézanne exhibition, it is instructive to visit a nearby hanging where the gallery is displaying works which portray earlier depictions of peasants. 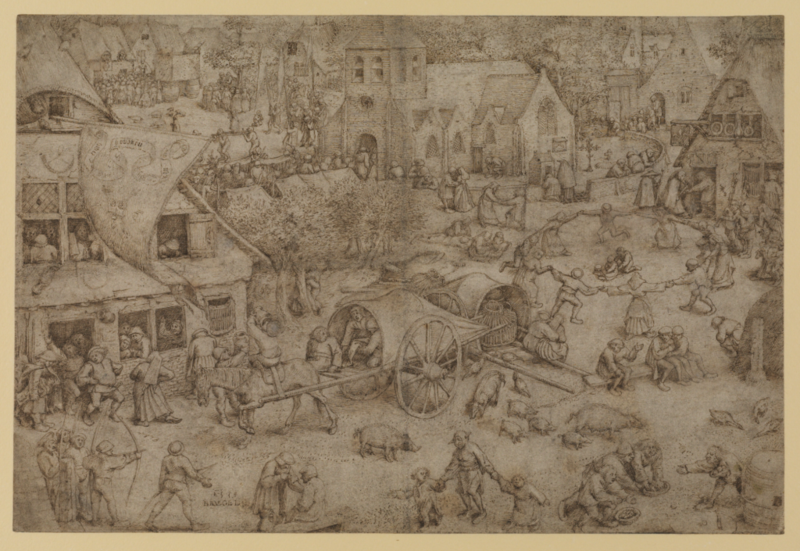 ‘Drawing Peasants’ features primarily Dutch and French works from the 17th century which were typical of the way artists formerly portrayed the labouring classes. Their features, with few exceptions, are shown as rough and coarse. There is little dignity here as the figures are seen in ungainly and undignified poses, such as squatting or spreading their legs wide, postures frowned upon in polite society. They are frequently drunk and lecherous. Portrayed as figures of fun, the drawings were bought by wealthy bourgeois to hang on their walls for their private amusement. One early work typifies this theme. Brueghel the Elder’s Kermesse at Hoboken of 1559 depicts what at first seems a charming rural scene as villages gather at a village fair, enjoying themselves in harmless activities. A saint’s effigy is paraded through the town behind a church procession in the background while an archery tournament takes place to the left. However, on closer inspection a drunk is urinating against the tavern wall while another defecates in full view. The most prominent image in the centre ground, however, is that of a covered wagon which is actually a mobile brothel, hauled from one village festival to the next. The contrast with Cézanne’s peasants could not be more stark. Here the artist was re-inventing the genre and experimenting with form, composition and palette at the same time. 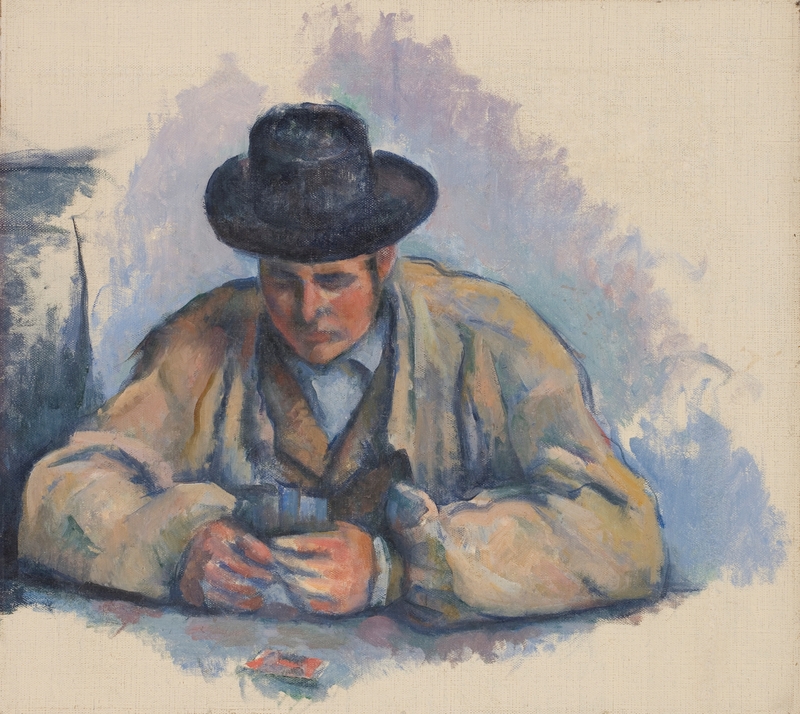 The Courtauld has worked closely with New York’s Metropolitan Museum of Art to bring together three of the five Card Player canvases and numerous associated studies and related paintings. The two institutions have also used technical analysis to challenge the current consensus around the order of production of the principal works. Co-curator Dr. Nancy Ireson explains: “The paintings have never been studied technically like this before. We started a dialogue with the Met and have been working closely with them for the past two years on this. 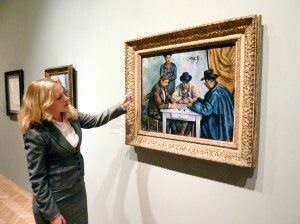 Traditionally, art historians have surmised that Cézanne worked from the larger canvases down to the smaller, defining his technique and approach, although this would have been contrary to the artistic practice of the time. However, the technical analysis has shown large areas of under-drawing and alterations on the smaller works such as the Metropolitan’s multi-portrait canvas, which the artist most likely refined in the larger Barnes painting. 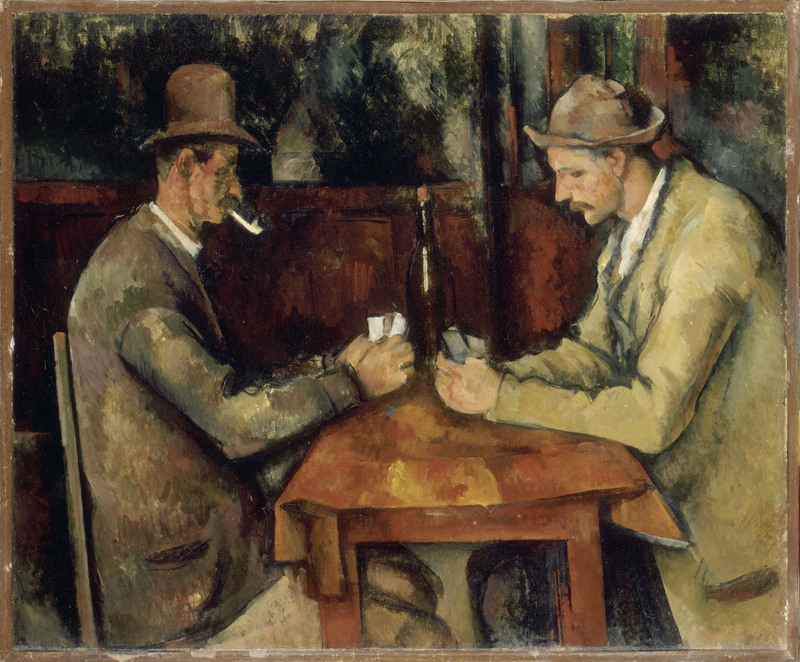 Of Cézanne’s Card Player series, two are multi-figure compositions and three two-figure works and the Courtauld is displaying three of these, including the Met’s multi-figure canvas. Although there is general agreement that the multi-portrait works preceded the two-figure canvases, the scientific analysis indicates that this latter series began with the Musée d’Orsay work, followed by the canvas from a private collection. This last work has not been seen for more than fifty years and was unavailable for technical study. Finally, perhaps, came the Courtauld’s own painting of the scene. The Jas was Cézanne’s family estate in Provence which he had inherited upon the death of his father, a wealthy banker, when he was in his forties along with a fortune of 400,000 francs. Cézanne père had wanted his son to become a lawyer and he did attend law school in Aix for two years, but he was also taking drawing lessons and left for Paris in 1861 to concentrate on his art. By the time he came to work on the Card Player series, he had been influenced by the first wave of Impressionism, fell under the influence of Pissarro, worked with Renoir and Monet and finally settled in Aix, Cézanne’s place of birth. Work on the Card Players began soon after Cézanne was diagnosed with diabetes and following increasing marital problems. He, his wife and child, Paul junior, had been to Switzerland, perhaps in an attempt to repair the marriage, but while he returned to the farm in Provence, she and their son settled in Paris. It was also at this time that the artist began to turn increasingly to Catholicism. 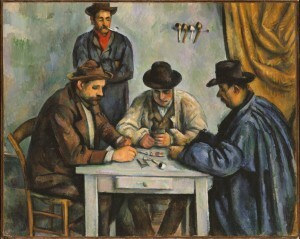 The Card Players and associated works seem to provide a region of calm which was lacking in Cézanne’s own life at the time. He used his gardener and workers from his estate as models, sketching and painting them each individually before inserting their figures into the final work. They were paid five francs a sitting for their pains and the same faces feature repeatedly across the series. The repeated attempts in drawings and oils to capture exactly what he was striving for were unusual for Cézanne and indicate a continual search to find the essence of this artistic endeavour. He told a visitor to his studio that he wanted to produce “something solid and durable, like the art of the museums” and there is no doubt that, in the monumental forms of these working men, he achieved his aim. Study for the Card Players c. 1890-92 - Worcester Art Museum, Mass. 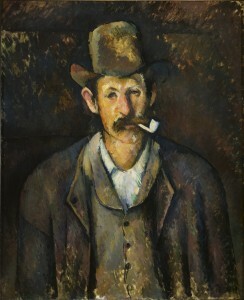 Cézanne’s contemporaries tended to read the works in one of two ways: that they represented the true Provencal type which chimed with a move to reinforce local identity as workers drifted from countryside to town in search of labour, or that Cézanne himself closely identified with his workers as an enlightened patron. In fact, neither was correct. It is undoubtedly this sentiment which informs his Card Player series. Apart from the obvious fact of a card game taking place, there is no narrative here; the players do not look at each other nor do they communicate in any way. The settings are not actual locations and the background space in the two-figure paintings is not clearly delineated. 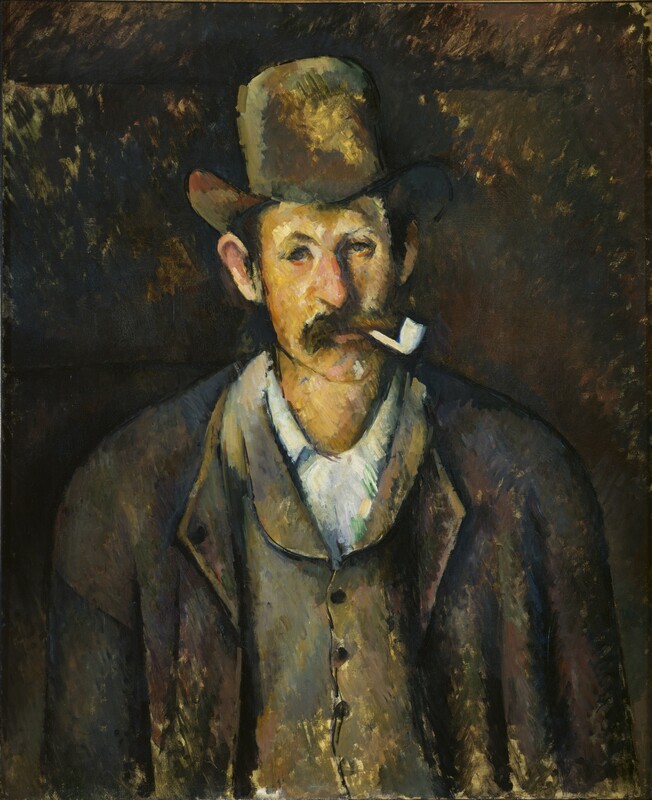 Some contemporary critics felt that this lack of application demonstrated a lack of talent in the artist and Cézanne himself admitted that he often had problems with getting his subjects in proportion – “I am a primitive, I have a lazy eye”. But it could also be argued that each successive work in the series represented a continuing effort to achieve the perfect distillation of form and character for Cézanne. 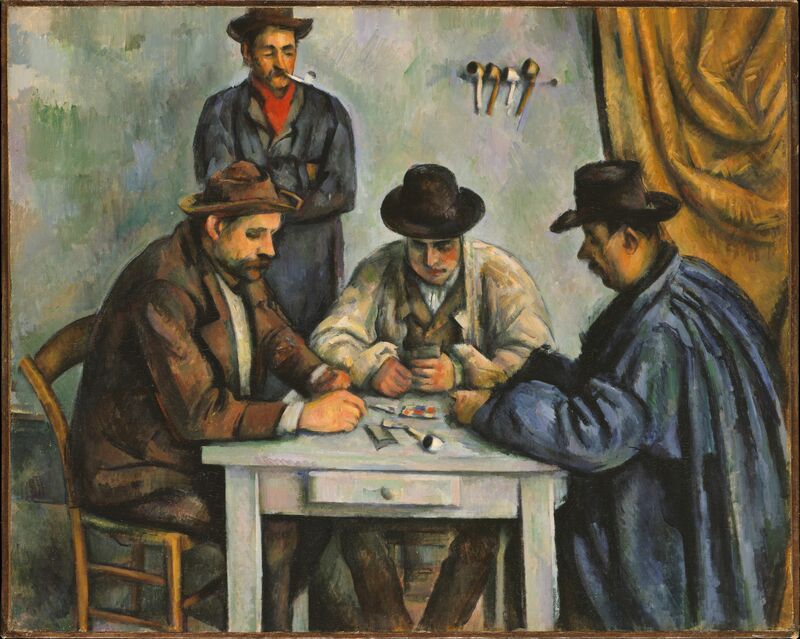 The sense of studious concentration shown on the subjects’ faces and their fixed demeanour may also relate to the fact that these men were spending long periods of time in a location – either Cézanne’s studio or a room in his own home – where they would rarely, if ever, set foot. They must have felt awkward having to sit for hours under the gaze of the boss as he painted away. Critics have also remarked that the fact that the models have cards in their hands in this context is not significant as they merely serve as props for the artist to study line, form, characterisation and composition. Indeed, Cézanne’s reductive approach and his eye for geometric invention inspired such artists as Picasso, Braque, Gris and others to experiment for themselves and to deconstruct form. 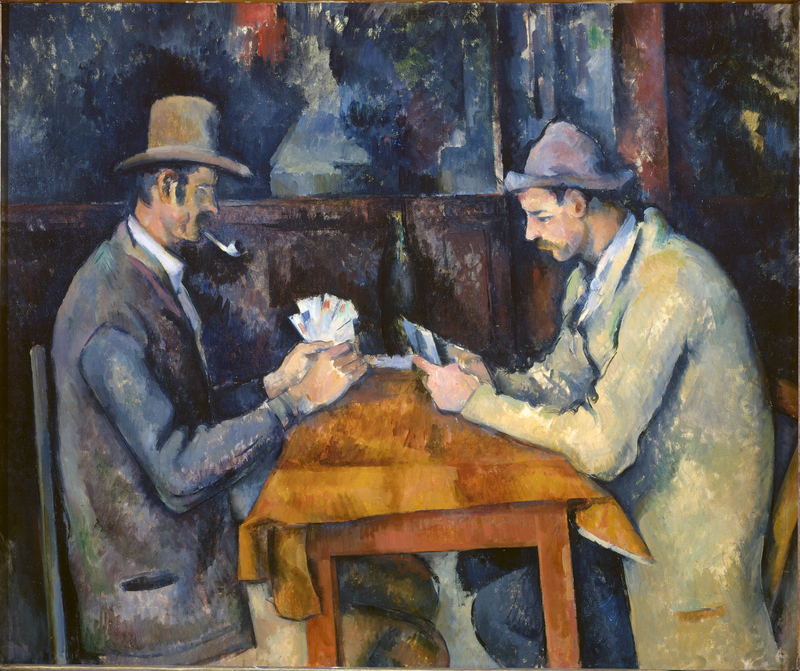 Another famous quote, attributed to either Picasso or Matisse, has it that Cézanne “is the father of us all”.